1 drawing on paper : ink ; 9.5 x 6 in. 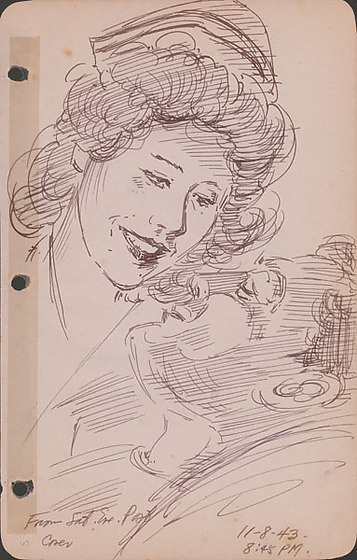 Ink drawing of a Saturday Evening Post cover depicting a nurse smiling at a patient. Close up view of woman wearing nurse's hat over curly hair smiling down at man with head tilted back and eyes closed. Written in black ink, bottom: From Sat. Eve. Post Cover, 11-8-43, 8:45PM. Written in pencil, bottom left corner: 67.